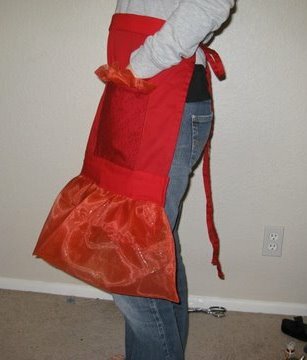 My partner for the Cheap Hot Mama Apron Swap requested “RED<RED<RED<” and chose the Wild and Crazy theme. We were supposed to use only things we already had, thus the Cheap part of the title, and red is not one of my main stash colors. I could do anything with a blue or green request, and I was struggling with finding enough red for her. I pulled out my few pieces of reddish fabric and let them sit for a few weeks. Several days before the deadline I remembered a new full apron I won in a contest last fall and I decided to refashion it. 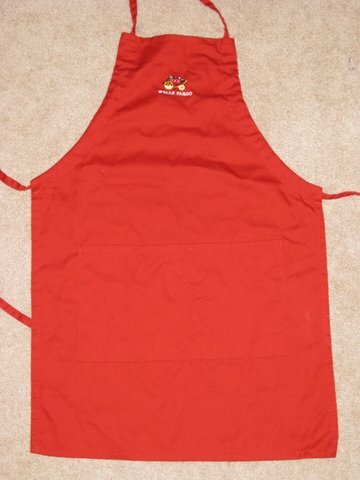 The pictures make the apron look more orange than it really is. 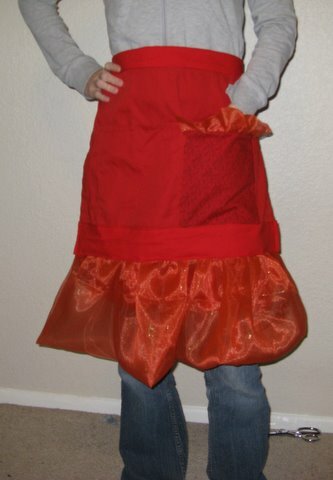 The ruffle is a shimmery sheer orange and the rest is red. 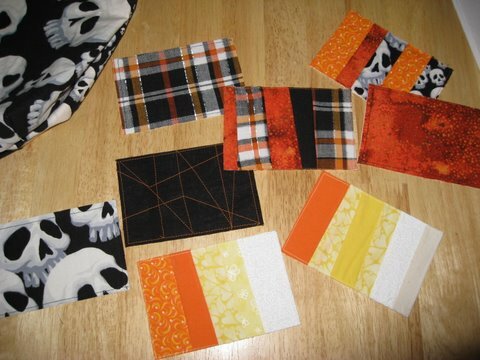 I covered one of the existing pockets with a darker red print and did two bands of tomato across the top and bottom. I used the original apron’s narrow ties. It’s the first apron I’ve made for a swap that’s not lined or reversible. When taking a picture I was asked, “What theme did she want,’gaudy’?” I said she requested “wild and crazy”. “Ah, that works too,” he said. February 7, 2010. 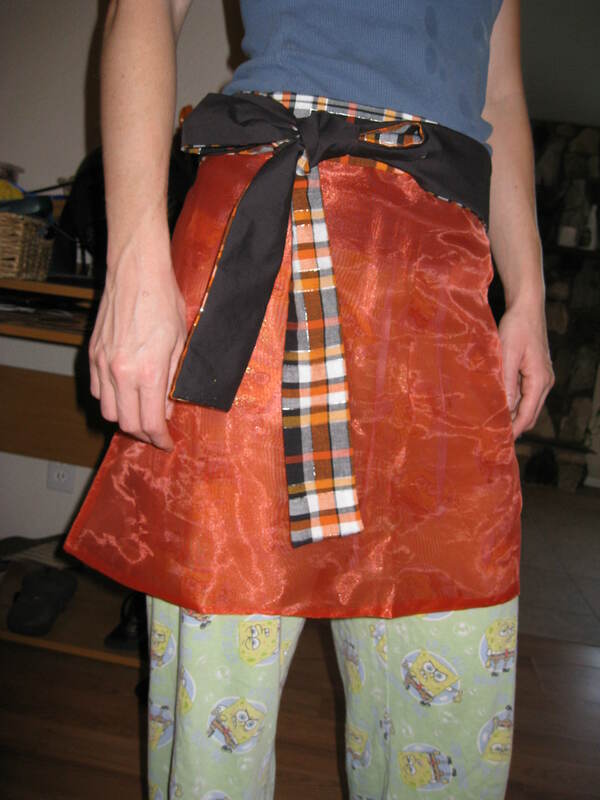 Tags: apron, apron swap, refashion, swap. Pictures, Projects, Words. 3 comments. I received a delightful apron from Ruth in the latest Hot Mamas apron swap. I wore the apron that very same day — within an hour of opening my package, actually — while making cupcakes and I didn’t want to post about it until it was out of the laundry pile and ready for a picture. 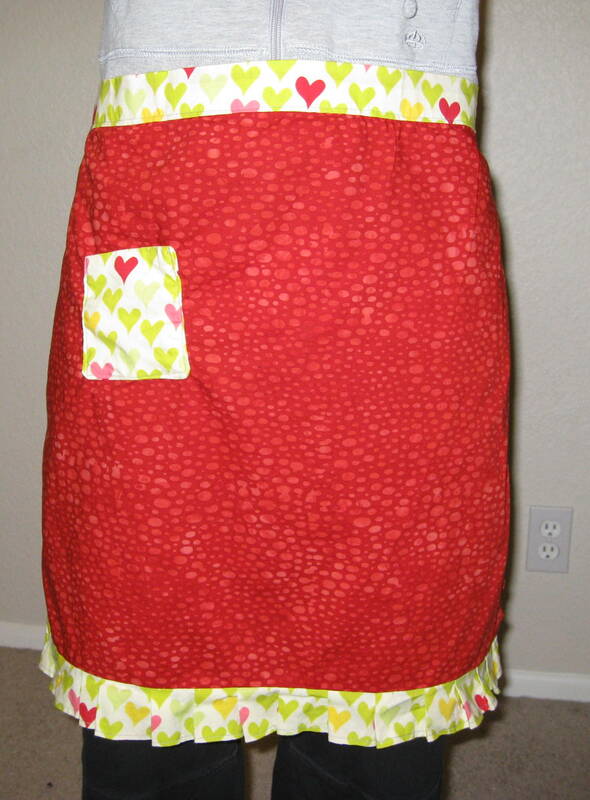 It’s a perfect apron for me: vibrant colors with a precise ruffle at the bottom and simple as I like it (not a lot of unnecessary frippery mucking things up with cutesy-ness) and I know I’ll use it frequently in the kitchen. I love the red fabric. As a certain man said, “It looks like an apron a dinosaur might wear,” meaning the pebbled pattern could be the skin of a dinosaur. It even looks good with my workout clothes, short socks and all. “I do want some, so don’t eat them all, ok?” I said. Yes, they were all truffles. I liked the white chocolate ones the best. Thank you Ruth, from both of us! February 3, 2010. Tags: apron swap. Links, Pictures, Words. 1 comment. October 18, 2009. 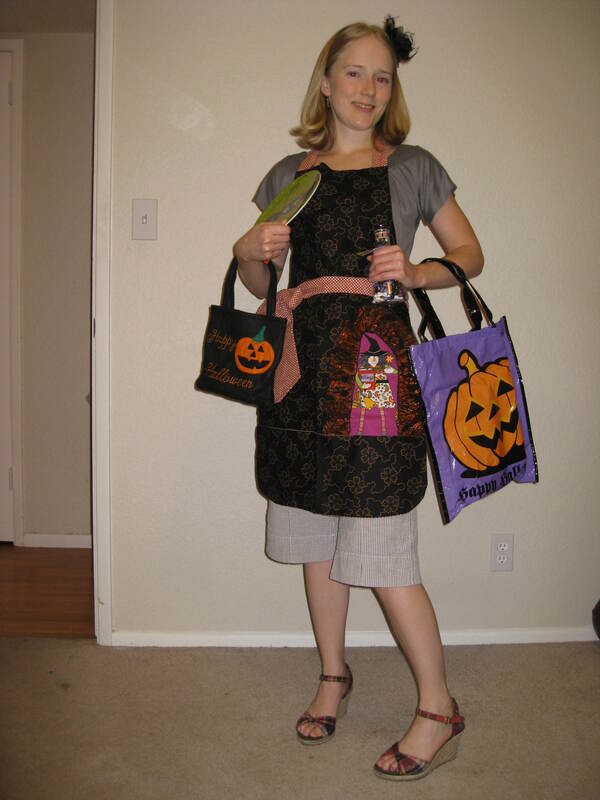 Tags: apron, apron swap, Halloween, swap. Pictures, Words. 1 comment. I haven’t participated in an apron swap since St Patrick’s Day, when I received a lovely apron that I use on a regular basis (my partner correctly assessed from my blog that I’m “not a cutesy kind of woman” and made me a great, simple green apron that doesn’t scream Saint Patrick’s Day Check Out These Adorable Leprechauns and Clovers OMG Adorable With the Green Lace!). 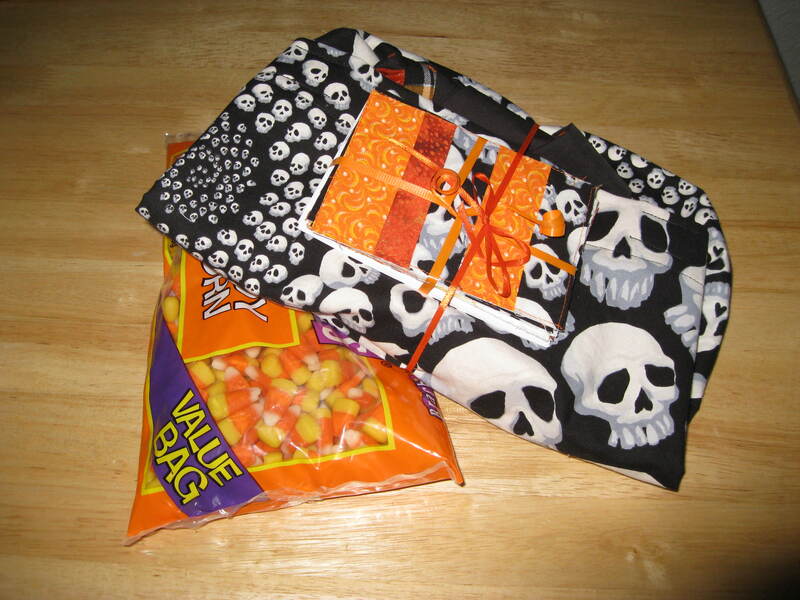 I think it’s time for another swap, and I just came across Aunt Pitty Pat’s Halloween apron swap. I’ll receive my partner assignment in a week, and aprons are due by mid-October. For anybody who has considered signing up for a swap and hasn’t done so yet, I highly recommend it. Now is the time! August 29, 2009. Tags: apron, apron swap, swap. Links, Words. Leave a comment.